A small galaxy in our local neighbourhood that was discovered just last year has recently received special deep imaging. Eridanus II (Eri II) is one of several new dwarf galaxies residing close to the Milky Way that have been discovered by comprehensive surveys such as the Panoramic Survey Telescope & Rapid Response System (Pan-STARRS), and the Dark Energy Survey (DES). This little galaxy however is unique; it is the first of its size to have a globular cluster. Globular clusters are compact, spherical balls of ten thousand to a million stars bound by gravity. It is thought they live in galaxies or on the edge of galaxies, still within the dark matter halo of their host galaxy. In fact, the number of globular clusters in a galaxy is correlated to the mass of the galaxy’s dark matter halo. After the discovery of Eri II last year, a researcher suggested that the dwarf galaxy might be host to a star cluster after looking at low resolution imaging. Last October Dr. Crnojevic and her team set out to observe the dwarf galaxy in hopes to discover the smallest known galaxy with a star cluster. Using a camera called Megacam on the Magellan Clay Telescope, the researchers spent two hours observing Eri II allowing them to see almost 16 times dimmer objects than previous images of the dwarf galaxy. 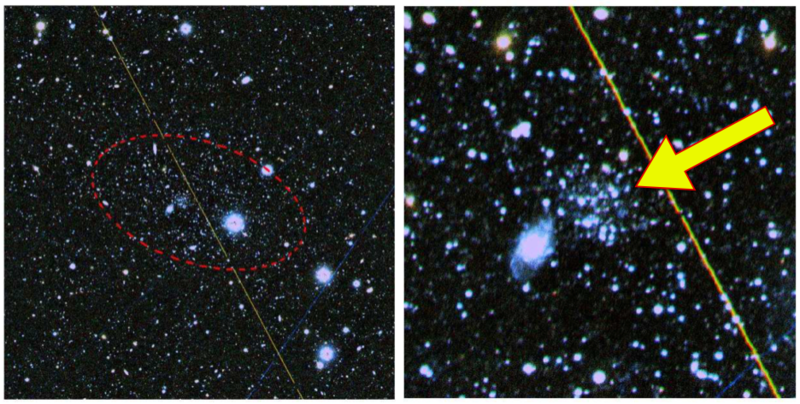 After processing the images the cluster can be clearly seen near the centre of the galaxy (Figure 1). With a measured radius of 13 pc, it’s a very extended cluster, but a cluster nonetheless. Figure 1. Image of Eri II. The red dashed ellipse encloses the galaxy. The image at right shows the central cluster up close. The blue and yellow streaks are trails from satellites. By examining the individual stars in the dwarf galaxy, it is possible to determine the galaxy’s age. This is done by creating an isochrone (like a family tree for stars) which compares the brightness and colour of a star taken at different wavelengths. A star’s location on this diagram can be used to determine it’s age. Most of a star’s life is spent burning hydrogen. But after it no longer has any hydrogen in its core to burn, it evolves through several stages, each of which can be identified on an isochrone. When a star has run out of hydrogen in the core, it burns hydrogen in an outer shell and has a core completely composed of helium. This is the red giant branch (RGB). Once enough helium has settled onto the core the temperature and pressure is sufficient to spark helium fusion. The stage of core helium burning is known as the horizontal branch (HB). An isochrone for Eri II (Figure 2,3) revealed the galaxy to have an old population of stars but also a younger intermediate aged population. 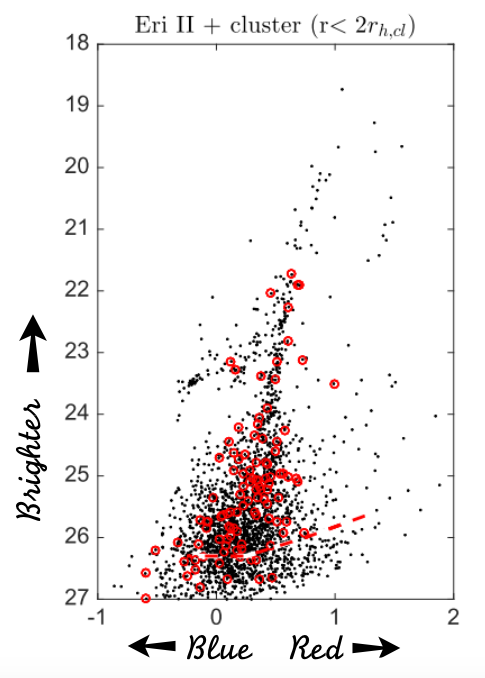 The red giant branch and horizontal branch showed a population of old (>10Gyrs, i.e. over double the sun’s age), metal-poor stars as well intermediate age stars (1-9 Gyr) that have more metals. The stars seen above the sub-giant branch (the first step in the RGB) seem to be 3-4 Gyr old. Using the horizontal branch, the researchers derived the distance to the galaxy to be 366 +/- 17 kpc, which is just at the edge of the Milky Way’s virial radius. Figure 2. Isochrone of all resolved stars in Eri II. This plot shows the evolution of the stars in the galaxy. The numbers on the x-axis are a way to quantify if a star shines more short wavelenght light (blue) or long wavelenght light (red). 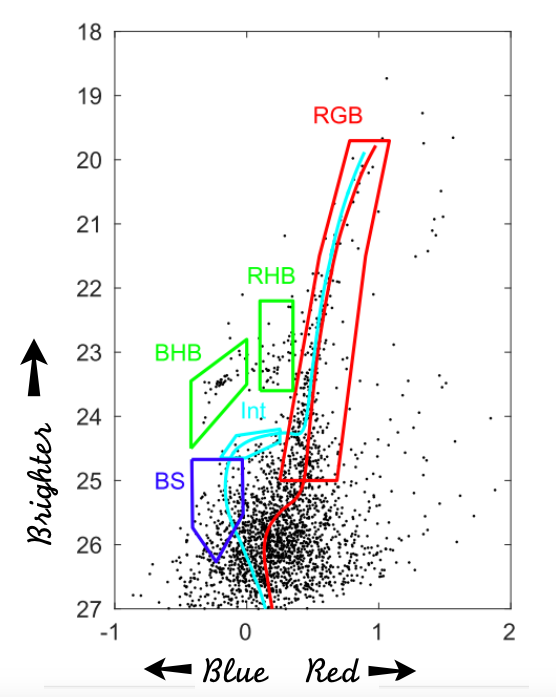 The red giant branch (RGB) is circled in red, the blue and red horizontal branches (BHB, RHB) in green, and an evolution track for an intermediate age star in light blue. Figure from today’s paper. Figure 3. An isochrone for Eri II with all stars from the cluster marked in red. Figure from today’s paper. The group also looked for neutral hydrogen (HI), which is indicative of gas, in the galaxy using the Green Bank (radio) Telescope. However, they were unable to find any HI, meaning the galaxy is extremely gas-poor, which is common for dwarf galaxies. 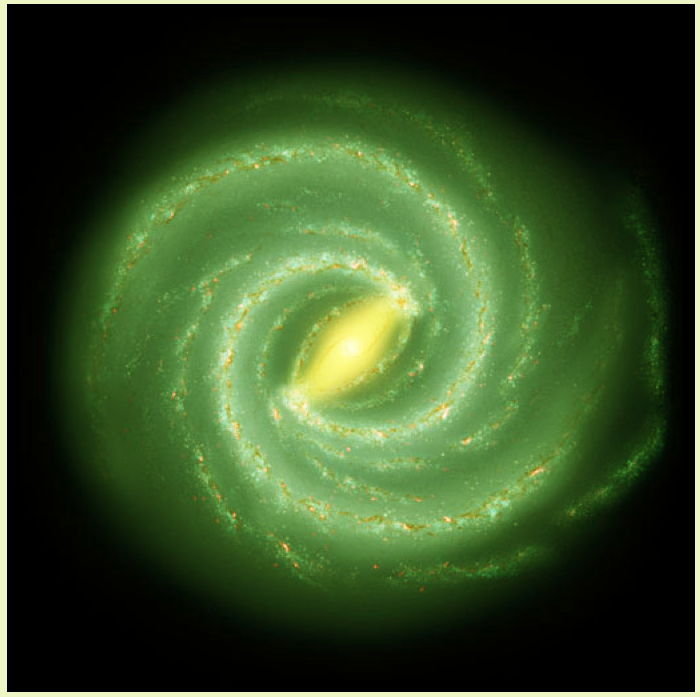 The lack of gas suggests that the Milky Way has previously encountered this galaxy, sweeping away gas in the process. Since the stars don’t appear to be disturbed, it is most likely that the gas was removed through ram pressure (pressure from moving through a fluid, similar to biking into the wind) by the Milky Way’s coronal gas (hot, diffuse gas between stars) during a previous passage. Although there are a few other faint dwarf galaxies that may have their own globular clusters, this is not a common phenomenon. Another recent paper suggests that some of the globular clusters that reside in the very outer halo of the Milky Way may actually belong to their own small systems just like Eri II. These mini galaxies would, however, be very dim, which is why they have not been detected to date. Further investigation of Eri II and other unique dwarf galaxies can help us better understand how globular clusters form and the true extent of the dark matter halos of these galaxies. Allow me to point out a minor error (because it’s obvious from context): “Mpc” insted of “kpc” in the fifth paragraph.